My very first project: A custom modular not only guitar effect built from Doepfer modules. It incorporates four active modules (A-119 Ext. In./Envelope Follower, A-140 ADSR, A-146 LFO2, A-109 VC Signal Processor) and one multiple (A-180), powered from the Doepfer A-100 miniNT. The A-119 analyzes the input signal and derivates a gate and a envelope signal. 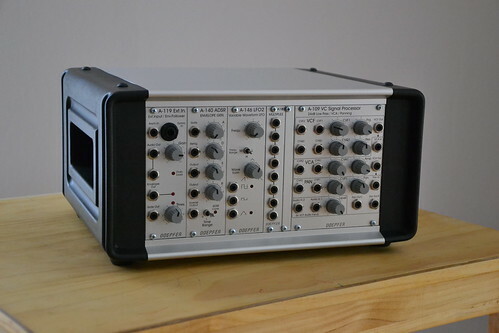 The A-109 is the heart of that mini system. It consists of a Lowpass VCF, a VCA and last but not least a VC Panner. The modules utilizes a CEM3379. The A-140 ADSR and the A-146 deliver control voltages to manipulate the sound. The aluminium case is a table top housing from ProMa.